Is there a grammar for duo/group Dance? It uses Body, Action, Space, Time, Energy. Those are good but seem a bit more fitted to solo dance. The chart does address relationships under Space and Time. I'm wondering if there is a Dance Theory that does a similar thing for all elements, such as Actions in relation to others' Actions (maybe something like Approach and Withdrawal?) Can you point me to a Dance Theory article or book that would address this? Comments for Is there a grammar for duo/group Dance? You're right. Almost all written content about dance composition addresses the solo dance. That table you linked is interesting. I see it is based on Rudolph Laban's ideas. Laban did indeed make a classification of different choreographic organizations for groups as well. That information is located in his "Dictionary of Kinetography Laban", which he arranged in collaboration with Albert Knust. Knust, Albrecht. A DICTIONARY OF KINETOGRAPHY LABAN (Labanotation) Vol. 1 and 2. Macdonald and Evans Ltd, Estover, 1979. That one is the first edition and I know there's another version by the editorial house Rhytmos, published in Poznán in 1997. You will find information about group configurations and different ways of relating between two dancers. However, it is presented in the form of examples and not in the form of a general theory or method for composing group dances. Still, one can use it with that purpose giving it one's own interpretation and application. You may also find related ideas in other dance composition books. Have you tried your search with that keyword ('dance composition')? 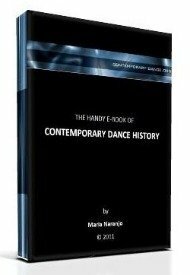 I have no knowledge of one 'best book' about that specific topic but I know there are many new writings on dance composition nowadays. I hope this helps. It would be great if you let us know through this same thread if you find something interesting.